Though having cats, most pet owners may ignore kitty’s presence and are least bothered about when the cat is purring or has hit down. Providing your cat some space and little care is all they need. Blinding to their needs may end both you and your kitty to grave problem. Before anything goes wrong and worst happens, watch out the below important things that you should never do to your cat. Just thinking that your cat would enjoy outdoor splendor on own and would return whenever she needs it. This theory stands completely out of the way. The truth is different – your cat outside venture might be adventure, confusion or fright. She may run errantly on the roads or crouch under the bush fear of children or dogs. To keep your kitty safe, harness her with a collar when moving around in the neighborhood. When outdoors, ensure that she roams only under your supervision. Curious cats are always on the verge to explore and your screened windows can play havoc. Excitation of a bird flying by – may instigates your tabby to unknowingly dislodge that screen and tumble to the floor. If you are at work or at home doing something important in other arena of your house then certainly it would be long before you come to know that your cat is missing or is hurt badly. Assuming cats being indoors always and rarely grooming with other animals can never have those nasty pests then you are on the wrong track. 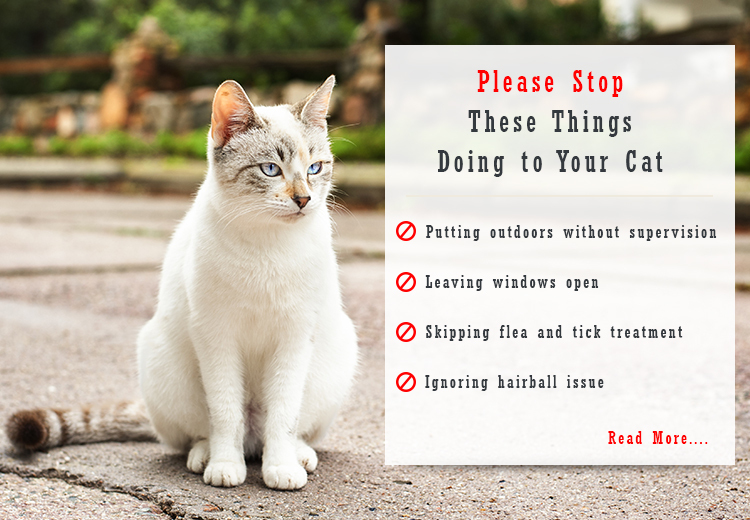 Irrespective of your cat’s indoor or outdoor status, they can get infected with fleas and ticks as these critters can come indoors and can feast on your cat. You may be unknowingly welcoming these fleas and ticks through your visiting friend with a dog coming or your clothing after hiking in the woods. Keep your kitty safe from the harmful reactions of these by treating them monthly with flea and tick preventives available. Leaving the blood-sucking critters to quest on your cat would be the worst thing to face. “It’s all safe to drive while holding your kitty on the lap” – if this is what you are thinking then beware you are probably facing a big danger. Cats usually don’t like to be caged into their car dens but a free moving cat in a car is definitely a furry missile. That furry ping-pong inside a car may result your driving into disaster before you reach your destination. Oh!!! so better buckle them up or put in crate for a safe and distraction less journey. If you fall in this category of thinking – Cats are their own groomers and can very well manage to keep their teeth clean then just dismiss this thought. Plaque buildup because of food particles sticking along with saliva can result into tartar, which can gradually result into tooth loss in your kitty. Though kitties are quite unreachable when it comes to dental regime, it is your “pet-terly” duty to ensure their clean teeth. If it’s not possible to perform on your kitty, hire a professional who can take care of it. A weekly dental regime will keep your cat’s gums and teeth healthy. Just throwing your kitty out from the table as she is curious to find what is so delicious there is not the right thing to do. Grabbing and throwing your cat will not only harm physically but also mentally. Try to handle her with care and she will be ready to act to your command. Cats with rich mane and coat are always pet owners’ pride. But, do you ever realize that this fur may at times lead to hairball issue. Normally, cat owners are least aware of this issue and just ignoring it which is most disastrous for your cat leading to fatal conditions. This condition can very well be controlled by proper grooming. Trimming excess hair and grooming can certainly control this issue and your cat will be happy with her stomach.